Since no one showed any interest in my Lauren Faust portrait, my family suggested that I drew someone more recognizable. Also, I'm an idiot. This is who I want to be when I grow up. Including the beard. Especially the beard. You can watch me draw this picture here. I do enjoy Terry Pratchett's Discworld :) Very intelligent humor and a lot of insightful things. Beard came out very well. Human face looks human. His nose looks a little tweaked to point to the right somehow. Great job with the lens distortion for how the side of his head is shown within. That's the first thing I thought, as well! Don't take it too hard, I didn't even know what Lauren Faust looked like. The only author I read, and I have almost all his novels. Now THIS guy I recognised easily, and I am sorry that I did not recognise the Faust one. Course you said "elephants on a turtle" and that clicked way more easily in my head for this guy <3 a legend of storytelling. Great portrait man! Sir Terry... I love that series of books. "And as the Druids of old I believe in Peace, the healing power of plants, harmony with nature, and the burning alive of anyone that doesn't approach this in the right frame of mind." 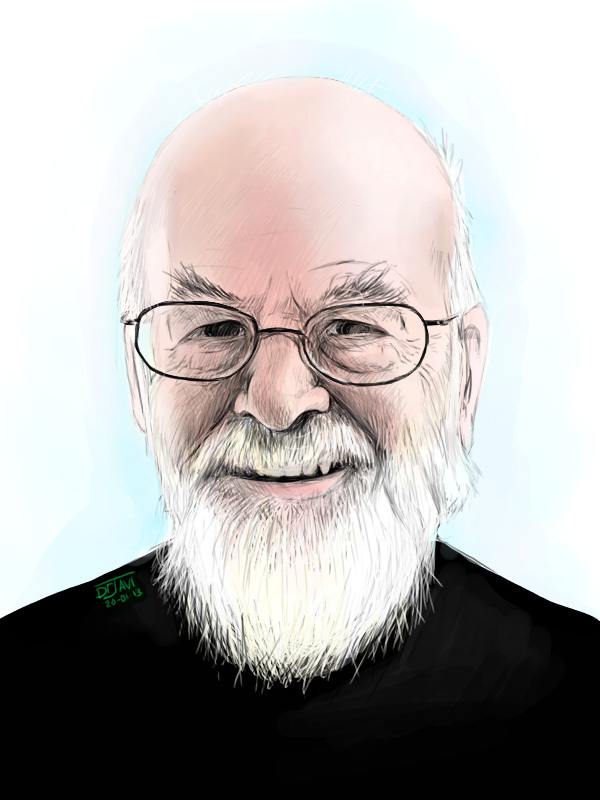 This is a belated comment, but this is an excellent portrait of Sir Pratchett. My currrent, and likely my forever, favorite author. /Now I just have to figure out how to do all the voices, for when I read the books to my still-hypothetical-future-children. //That is not my cow!